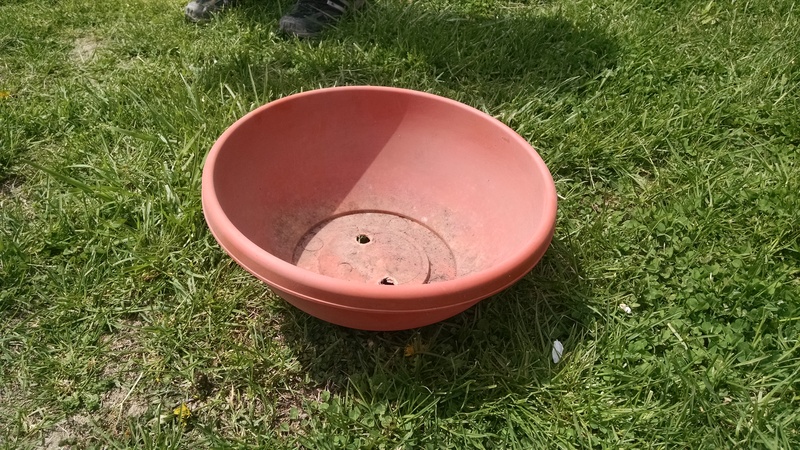 Okay, so maybe planting plants in pots wasn’t super exciting. 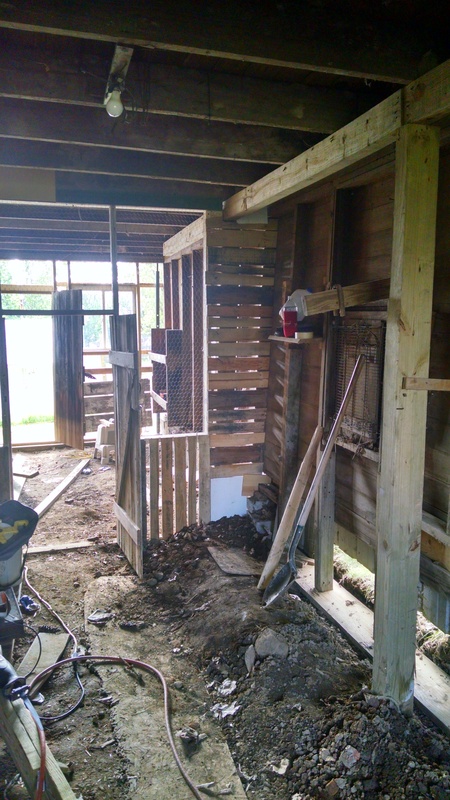 To make up for yesterday’s boring post, here is one chock-full of action: The Great Chicken Coop Adventure! Basically, we weren’t going to get chickens this spring. 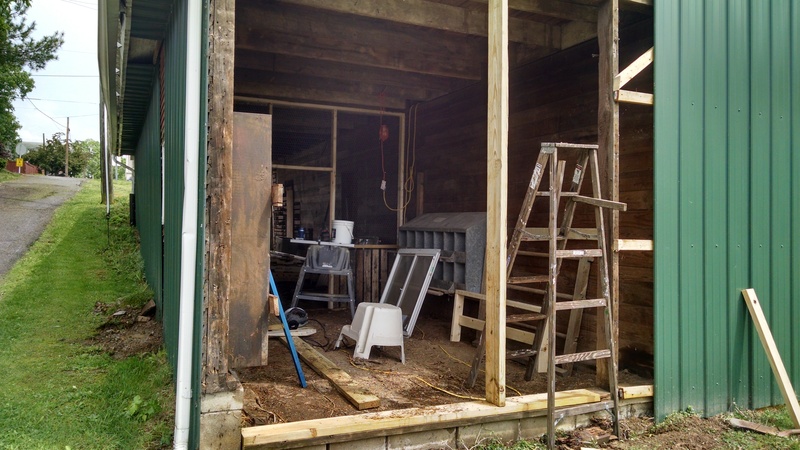 So much chaos in our lives anyway, and it was going to involve cleaning out a big section of the barn, cutting a door in the back, installing windows, building a fence – basically a whole litany of complications and sequences. As you may recall, our barn has two sides. 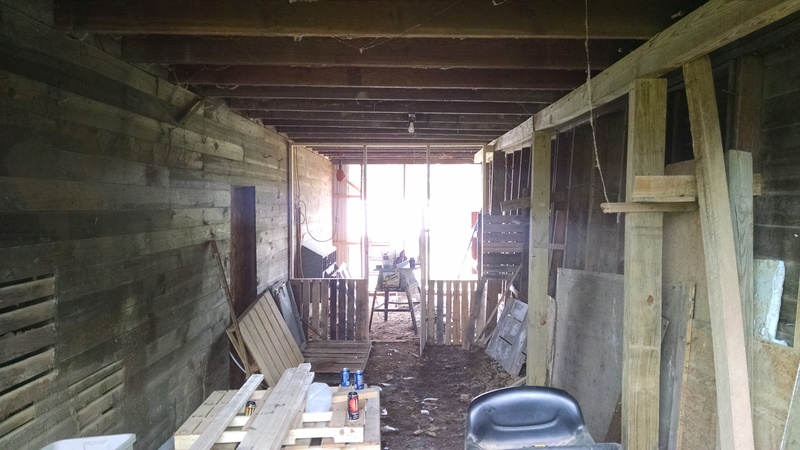 On the left is the main part of the barn, where Tom has his workshop and where we can pull in cars when we don’t have projects exploded everywhere. The right side, until this spring, was just full of stuff that had been there for years – even before we bought the place, Pop had an arrangement with the old owner to store things over there, so some of the things had been in there for over a decade. Well, we came home from an adventure in May (actually, we were visiting Waylon for the first time!) 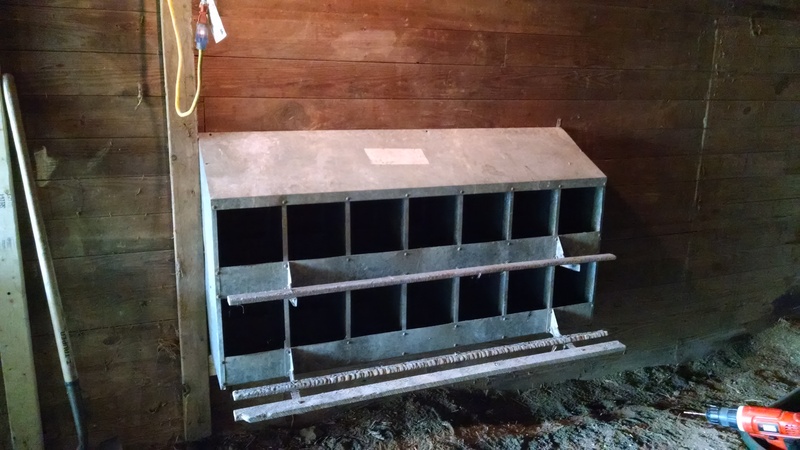 to find Pop energetically emptying out that side of the barn – so we could get chickens! 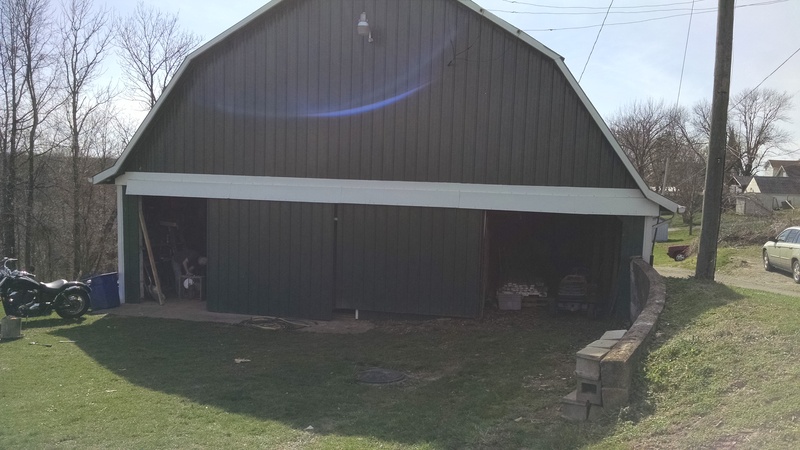 At one point, the previous owners did have chickens in the back of this side of the barn, and our goal was to make that same section chicken-friendly yet again. However, as with most projects around here, one thing led to another, and the whole thing got SUPER involved. First off, we had to start with the demolition portion. Val’s door came down to get refurbished, and a weird build-in cabinet that was falling over had to come out as well. Trash had been thrown back in the barn for quite some time, so the dirt floor was littered with a lot of stuff, including broken glass. 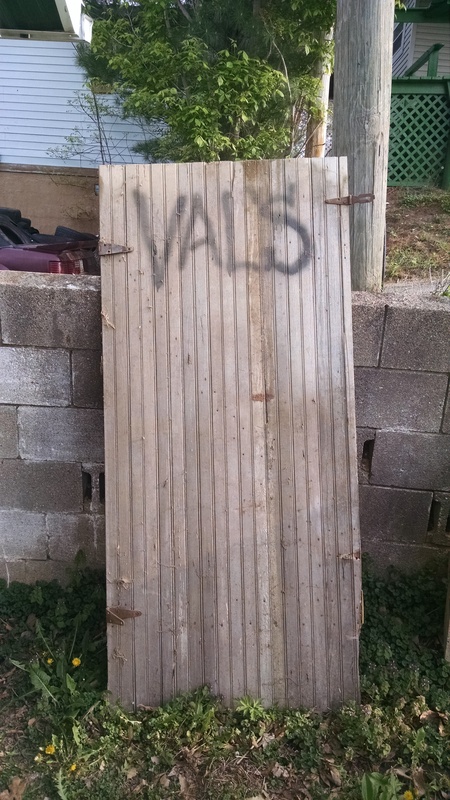 Val’s door is actually pretty sturdy and pretty adorable, so we decided to reuse it. This weird cabinet thing had to go, but we reused almost all of the boards for various other projects… basically, around here wood gets used until it’s nothing more than sawdust… and then it gets thrown in the compost bin! 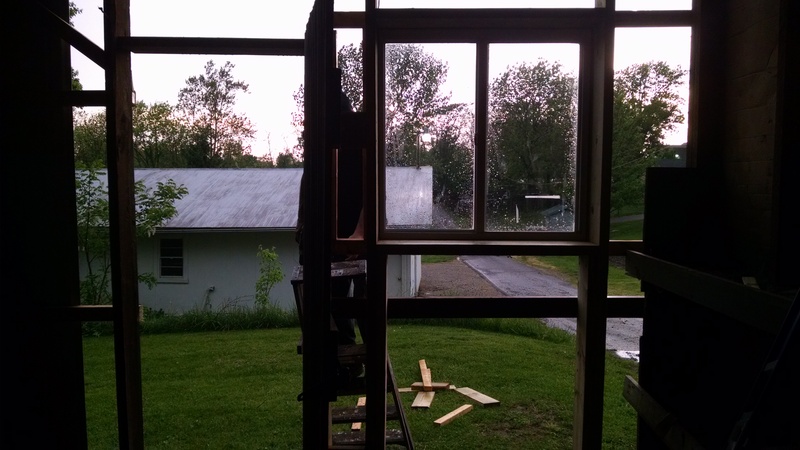 After cleaning a lot of stuff up and out, Tom began framing in the front wall of the chicken area. 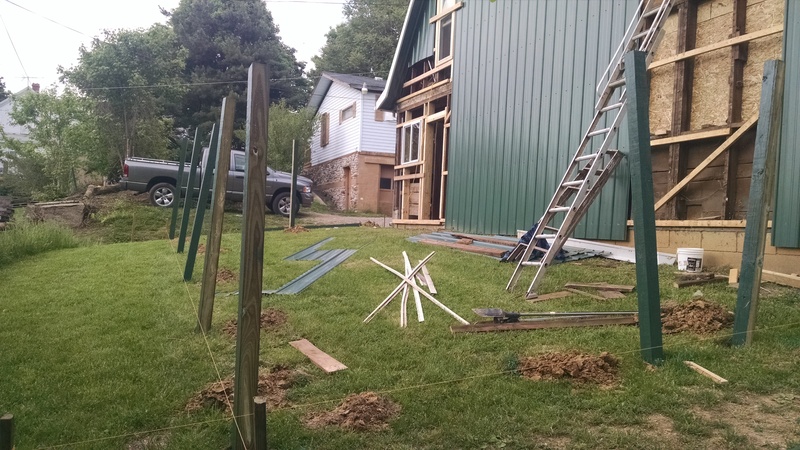 We basically decided to close off the back 20-25 feet (I can’t remember exactly) for the chickens by framing out a wall and using chicken wire for the actual wall bit. While Val had her door to the left, I decided I would rather have the door centered. 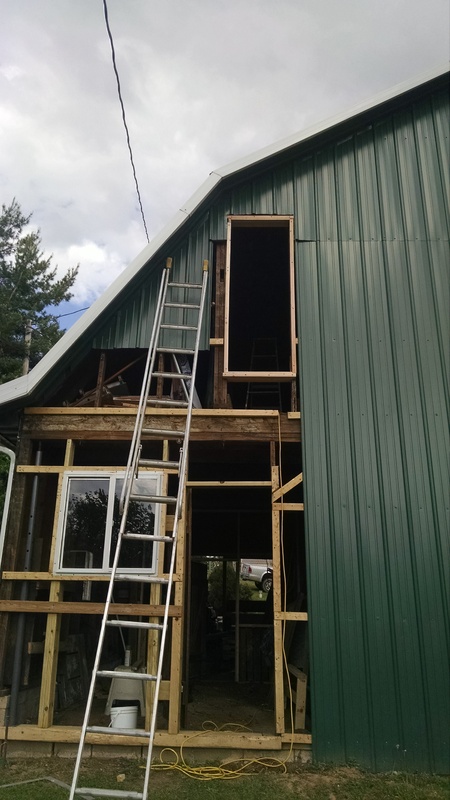 We also knew that we would be cutting a door to the outside through the siding in the back of the barn. Free pallets meant I got an adorable half-wall to tie-in with Val’s old door. 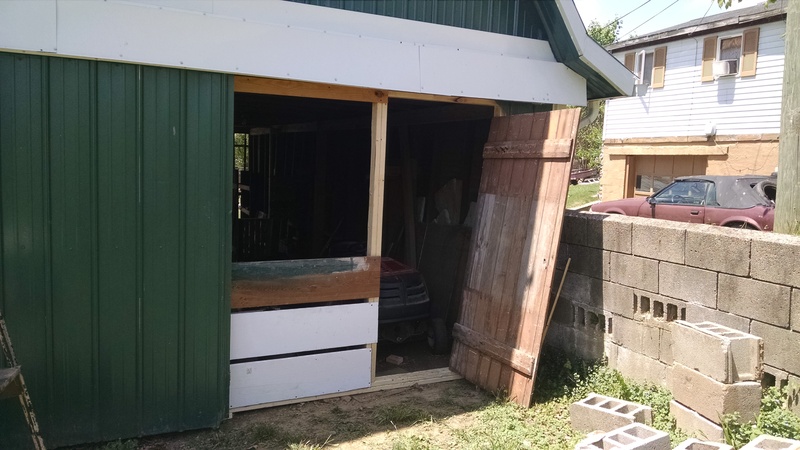 After installing the chicken wire on either side, Tom hung Val’s door back up… except now, I’m afraid, it’s just a door. I gave it a fresh coat of paint before it got rehung. I had some random pale yellow paint from about three houses ago, and it made the door light and happy. My brother is working someplace where he is able to get free pallets, so we got several from him, and Tom has been using them wherever he finds the need. 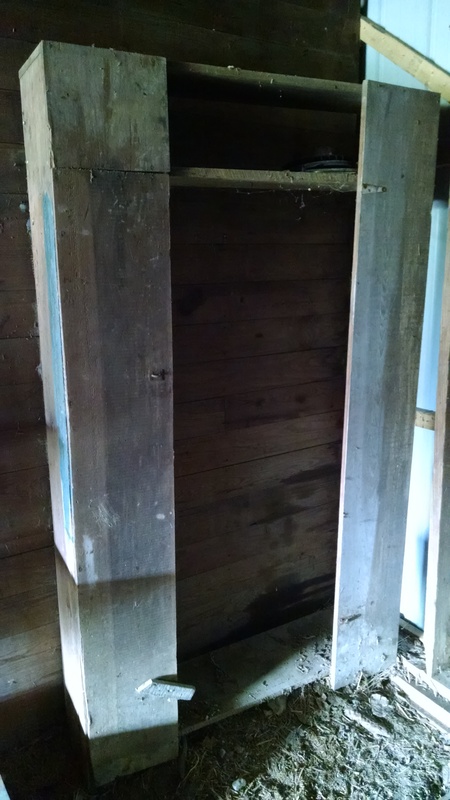 We used some of the boards from the pallets to build the adorable little half-walls on the bottom of the wall. It made the wall a little sturdier and cuter. Win! As a note, we aren’t super passionate about using every square inch of those pallets, so Tom just sawed them off on either side and then we pried them off the middle bit of the pallet. There are about seventeen nails holding each board onto that pallet, and it just wasn’t worth the time and effort to pull each one off independently. It meant we ended up with slightly shorter boards, but we also saved about a hundred hours of labor! Back when I was growing up, we had chickens in the most adorable little chicken coop ever. A friend of my parents gave them two sets of metal nesting boxes. When my parents moved out to their new house, they couldn’t bring the chicken coop, but they did bring the nesting boxes. I was pretty stoked to end up with one of them. It’s probably at least fifty years old at this point, and still going strong. Next, it was time for the back wall to come off! 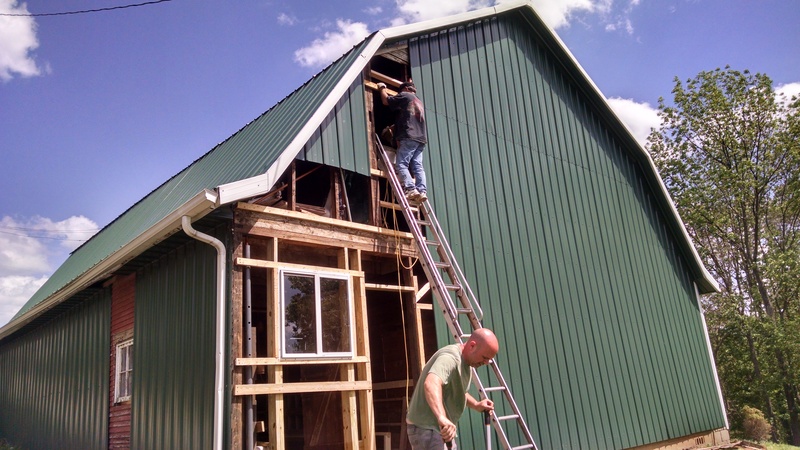 Several years ago, when the barn got sided, it was kind of falling in. They did a bit to shore it up, and then just slapped aluminum siding all the way around. 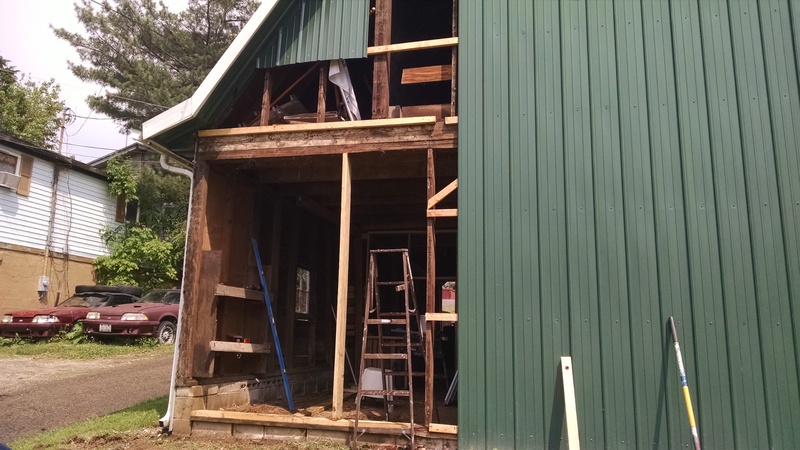 As you can see, there wasn’t a lot of original barn wall left on the back side, so by removing the siding, we basically took off the whole back of the barn. This was the point where we ran into one of our big sequences – the frame of the back wall was starting to look a little shaggy. 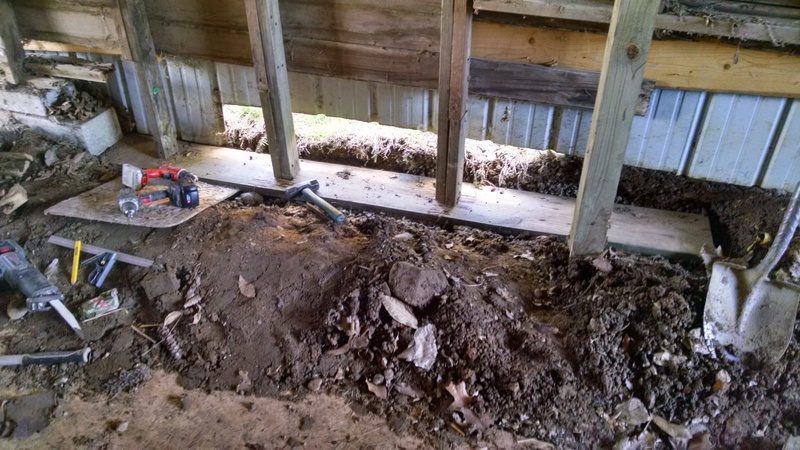 In the end, we ended up rebuilding the wall joists for that section. While it was a hassle (and a bit more expensive), it also meant that we could easily frame in the door and window exactly where we wanted them to be. Besides sawing off a bit of the door, I also had to pull out like a million nails. Why was this door just full of nails….?!?!?! 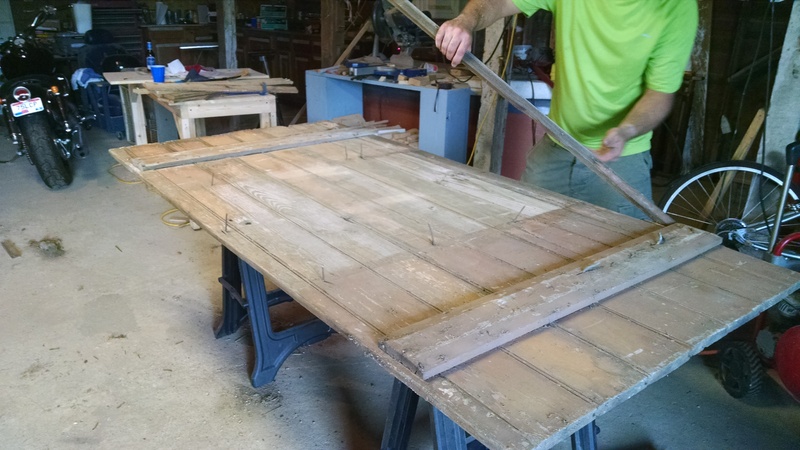 We found another old door in the barn (seriously, it’s one of those barns where you find all SORTS of random stuff) to use as our outside door. It was pretty raggedly on the edges, so Tom trimmed it up before hanging. Side note: This whole chicken coop is about a thousands times more involved than I anticipated. 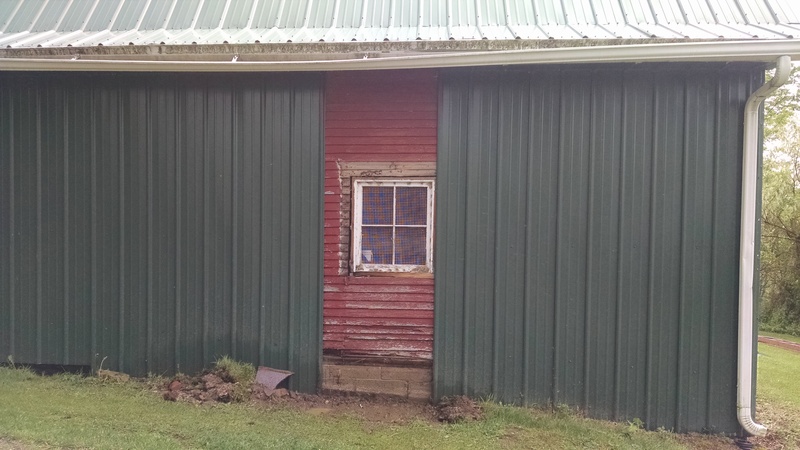 I was all for a small lean-to on the back of the barn! 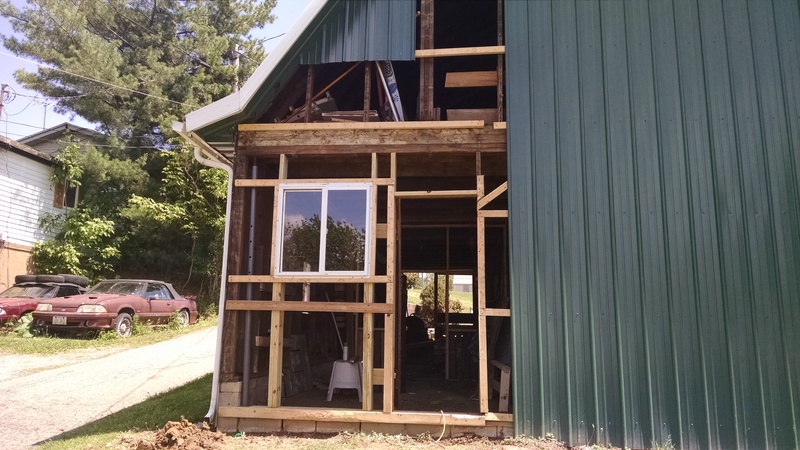 The extra framing work meant that the back was off of our barn for longer than we had anticipated, but it was exciting to see things, as they so often do around here, come apart and then come back together! 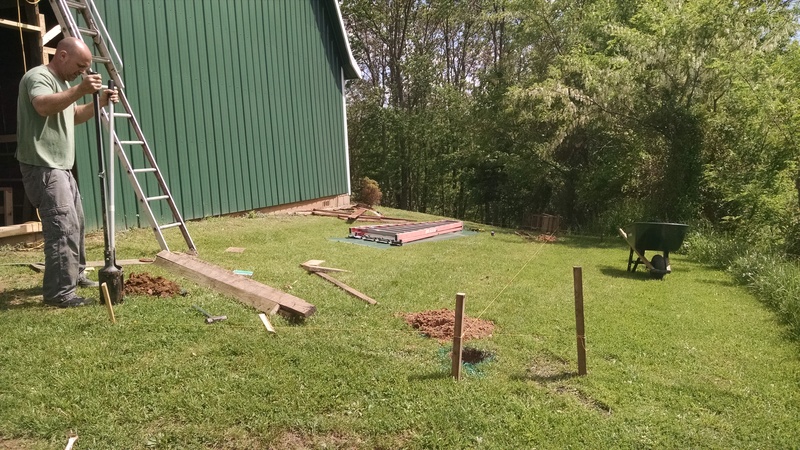 This was also another project where Pop did a lot of the manual labor, so we would be gone during the day and then come home to see the progress!!! 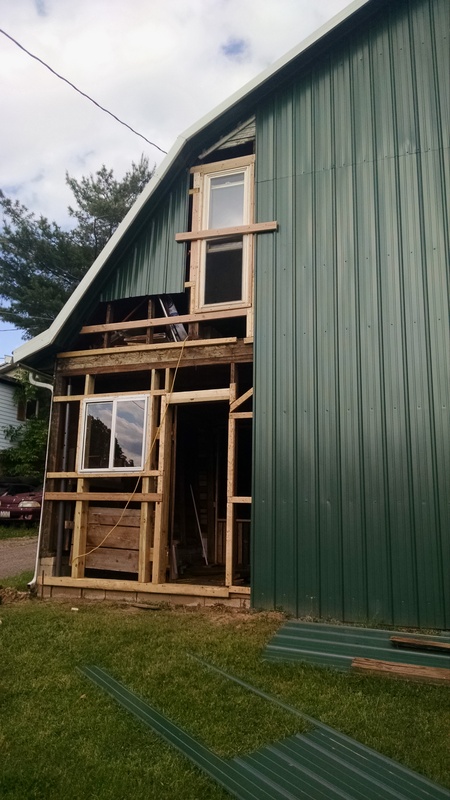 I mean, how hard could it be to put in an upstairs window while we already have the siding off…??? Back before it was falling in, this barn was probably super adorable. 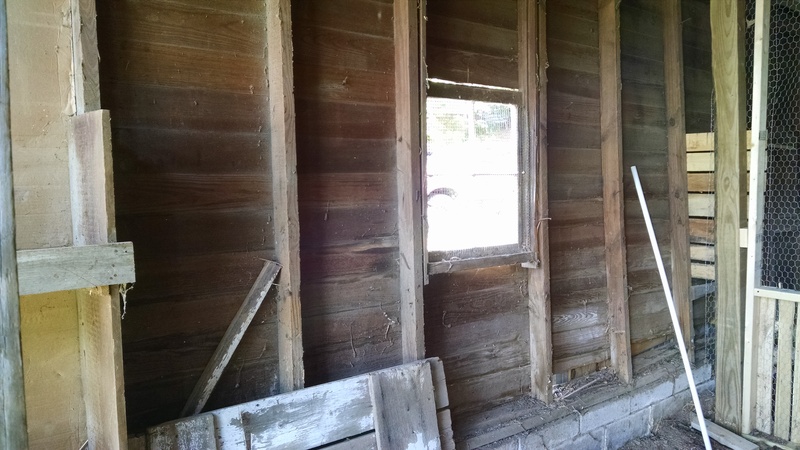 While most of the original barn wall is still intact on the sides, there are also a few windows that were just sided over. 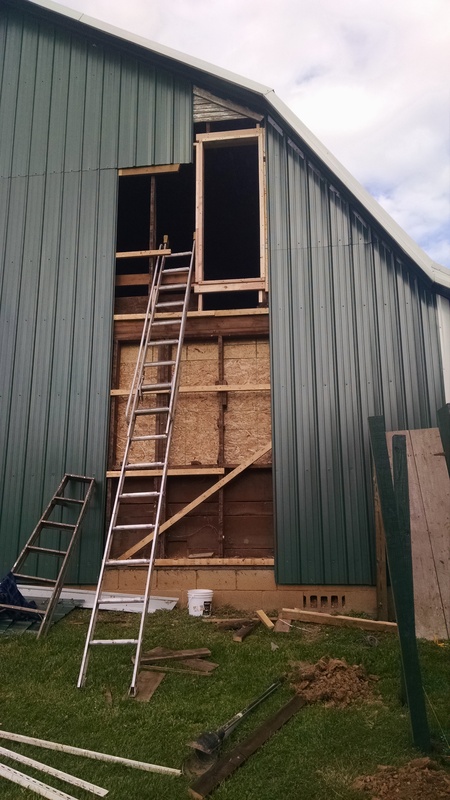 One of them is in the chicken area, and because one of the keys to a good chicken coop is ventilation, I really wanted that window opened up as well. Pop found an old window somewhere that worked to insert next to the back door. He framed it in while he was building the new back wall. 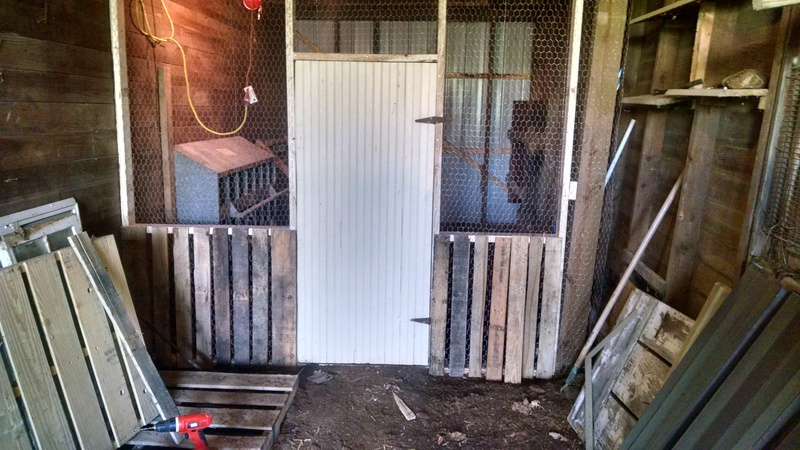 Okay, that is probably enough about our chicken coop for today… tune back in tomorrow for Part II! I am so overwhelmed by everything we’ve been working on that I legit have no idea where to start. So I guess I’ll just start going through pictures and see what unwinds!! 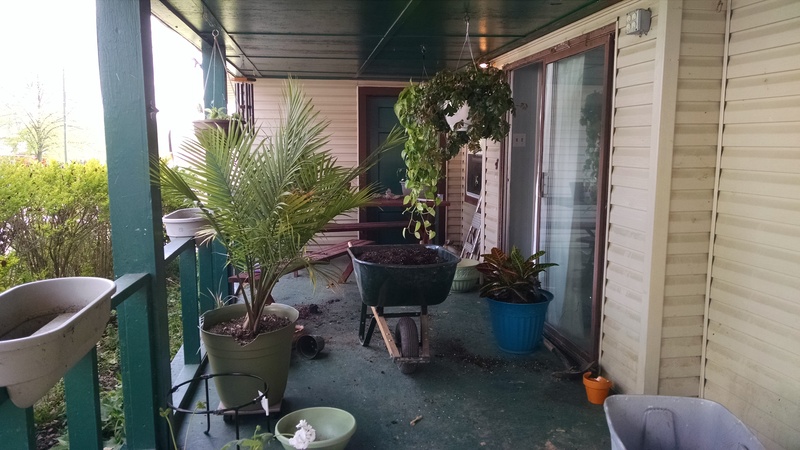 The first folder of pictures is from a day in early May when I mixed my own potting soil and worked on repotting some plants, so that seems like a good place to begin, even if it isn’t super exciting. Tom and I really love plants, even though I’m kind of terrible at growing them. We have a problem where almost every time we go someplace that sells houseplants, we end up buying one. Our last apartment kind killed a bunch of them because the lighting was really poor there, but at this house we have a couple of huge picture windows facing full south, plus, now that we’ve eliminated most of the walls in our house, the whole house has pretty bright light for medium and low light plants. I end up repotting almost all of my houseplants every spring. I have no idea if this is a good idea or not. 😀 Some of them need bigger pots, but even if they don’t, I will usually take them out of their pot, refill it with fresh soil, and then replant the plant. The plants seem to like it, and it keeps the soil from getting overly compacted. Plus, I’m super lazy about fertilizing, so it gets them some fresh nutrients, too! When I have a LOT of pots to fill (which I always seem to), I usually mix my own potting soil. The rough recipe is garden and/or top soil + peat moss + cow manure + perlite. Basically, I put in just enough peat moss to break up the clumps/wetness of the soil and manure, and then throw in perlite until it looks right. 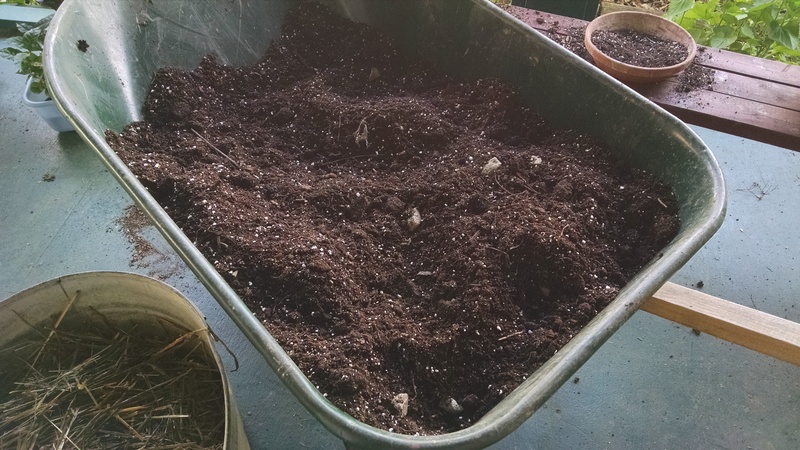 A completely full wheelbarrow usually costs me somewhere around $8 in materials, so it is definitely cheaper than buying pre-mixed potting soil. I also often will mix in last year’s potting soil, which reduces the cost even more. We now have an awesome compost bin (more on that later), so that should also cut costs next year. You know the ugly containers I’m talking about… ick! Another problem I frequently have with pots is that they are ugly in color. 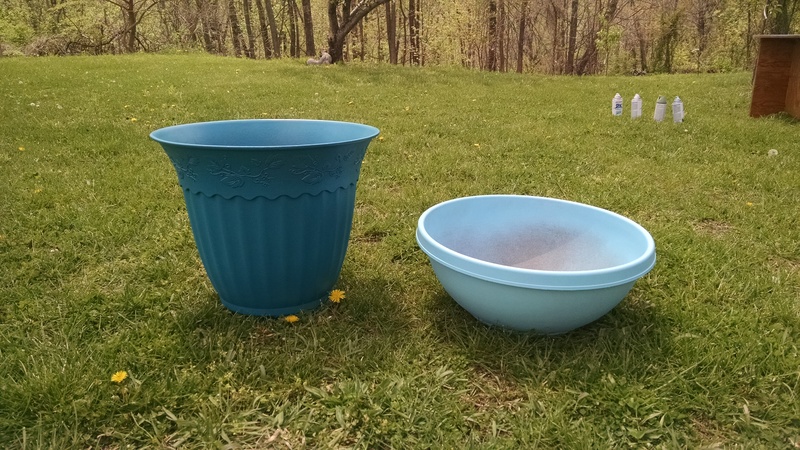 I don’t mind using the sturdy/inexpensive plastic pots, but they are usually either that gross terra cotta color, or something else equally ick. Nicer looking pots/containers can get really pricey. This year, I figured I didn’t have a whole lot to lose, so I bought some spray paint that claimed it would work on plastic – and it DID. I was super excited, because I seem to have a million of these containers around. I’ve done a lot of container gardening at all of our rental homes over the last several years, so there are pots and containers everywhere! Once I found out the spray paint was really going to do a thing, I rounded up as many as I could find and went to town. Even though our porch is currently dark green, we’re hoping to rebuild it later this summer/early fall, and it will end up sage green. For containers and other odds and ends around the garden, I’ve mostly been working on lighter colors, although I have to admit that this bright peacock blue doesn’t match anything… I just like it! Tom, being the painting expert, ended up doing most of the spraying. He’s really good at laying down even, non-drippy layers… almost like he does it for a living! 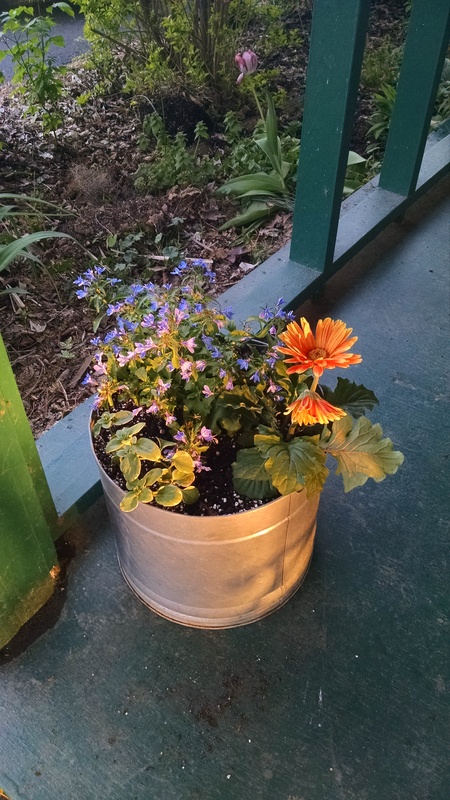 At any rate, I was super stoked about all my happily-colored containers, and filled them ALL with plants of all shapes, sizes, and colors. 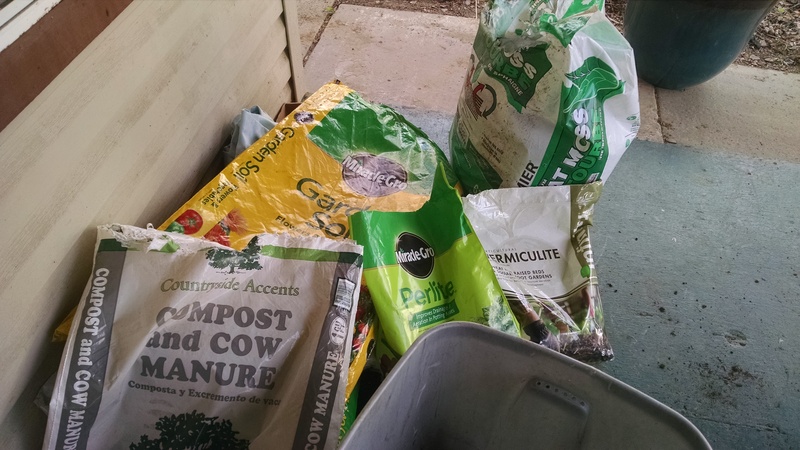 Potting soil ingredients… sometimes I throw in some vermiculite, too. I mix it in the wheelbarrow by hand, breaking up large chunks. It’s super therapeutic. Some of the houseplants in their new homes + pots to be filled. The front porch doubled as a potting shed for a few weeks! Um let’s see, was the last time I posted in April?! And did I faithfully promise to post more regularly…?? Well, that didn’t happen, and I have decided not to continue making promises I will probably not keep! However, it is a very rainy Saturday, so I am HOPING to queue up a few posts so that I can update you on some awesome projects that have been happening around here. As I mentioned last time, Tom and I went a little crazy this spring. After making very serious resolutions to show restraint, we threw them all out the window as soon as it started to get warm. 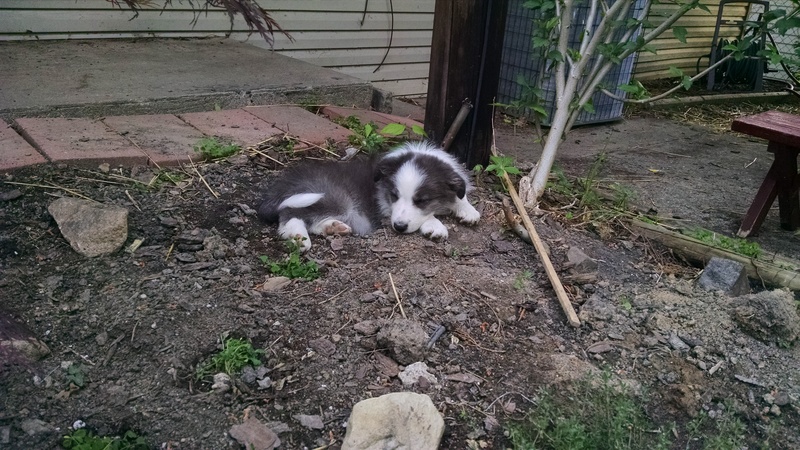 Somehow, we now have a puppy, chickens, an herb garden, a vegetable garden, an orchard, flowers, a water garden, and a lot of maintenance work to keep it all going! But we are super stoked about every single thing that we’ve done around here and I am really excited to tell you guys about EVERYTHING. In order to not overwhelm you (completely), I’m going to try and write a post for each major project we’ve been working on. Since all the projects were overlapping, the posts will overlap time-wise as well, but hopefully, in the end, you’ll have a big-picture idea of what’s been going on around the homestead! Also, we have passed our one-year ownership mark!! June 7, 2014 was when we got possession of the house. If I get around to it, I’m hoping to do some June 2014 v. June 2015 pics for comparison… we have done a LOT. 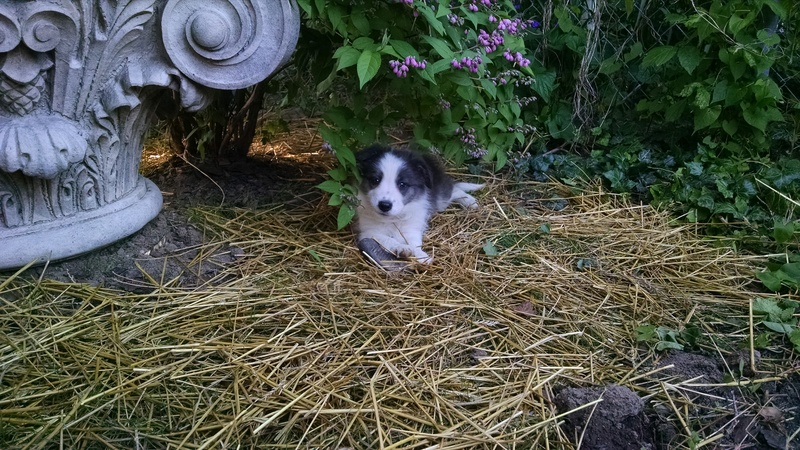 So, FIRST OFF: We got a puppy!!! Guys, he is TOO CUTE FOR WORDS. You do not even understand. He is a blue and white, and should stay that dark/slate grey color his whole life. Waylon is absolute terror, so full of energy. He gets into everything and is almost too smart. We have to work hard to keep him busy. 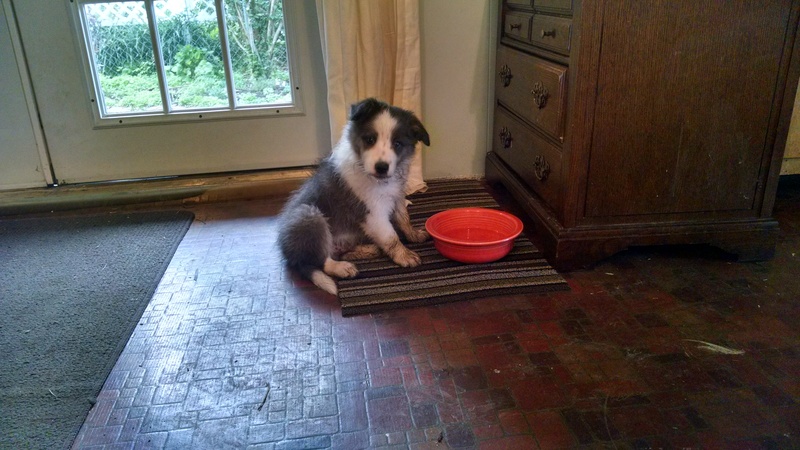 He’s housebreaking super well and starting to respond to basic commands. He spends most of his time nomming everything, terrorizing the cats, digging up my plants, and trying to convince us to throw things for him to fetch. 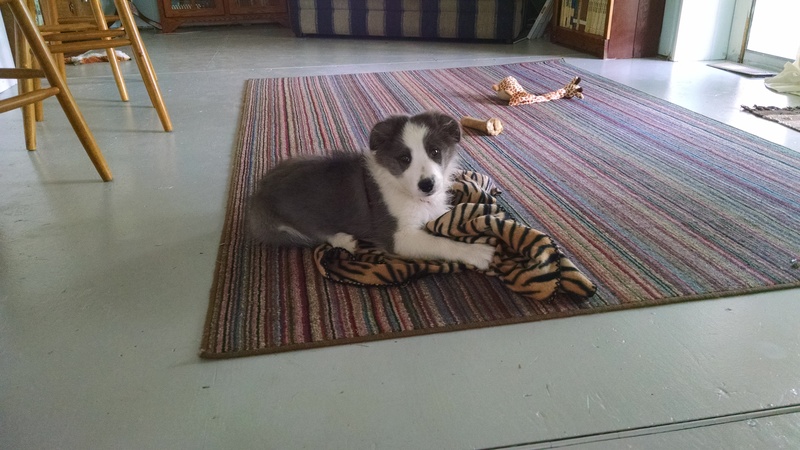 I have always wanted a border collie, so I’m pretty happy now. Waylon already enjoys being out on the trail, so we are hoping that he be a hiking companion for years to come. Okay, I’m going to leave you with a couple more Waylon pictures, then work on some of my other blog posts, which will hopefully be up over the next couple of days!! !